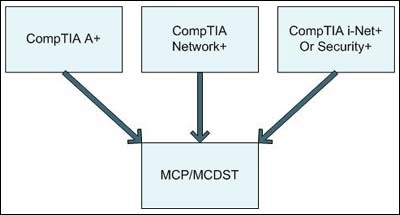 MC MCSE Article: Which Certification? One of the most common questions we get in our forums is, "Which certification should I take next?". Almost as common are posts such as, "MCSE or CCNA?". In this article, I am going to show you why these questions are inherently flawed and how a person can best decide for themselves which certifications are right for them. Certifications are tied to experience levels. Some certifications are for beginners, some are for experts. Understanding where you fit into that spectrum will help you determine which certifications are appropriate for you. Certifications are tied to specific job roles. 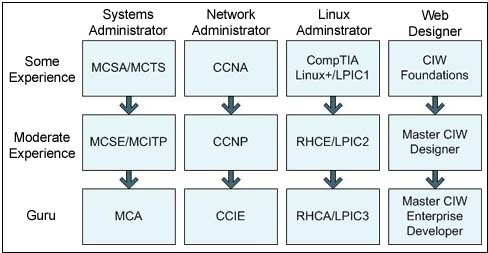 When people ask if they should obtain their MCSE or CCNA, they do not realize that what they are really asking is, "Should I be a systems administrator or a network engineer?". Obviously, the person posing the question is the only one that can answer that, making the question inherently flawed and unanswerable. Now that we have established those basic points, let's look at some of the certification paths and who they might apply to. We'll start with "Certifications for Everyone". These are the certifications that I believe that most people should take, particularly CompTIA's A+ and Network+ certifications. These exams address the fundamental building blocks that are used to some degree or another in most IT jobs. They are also industry recognized and the perfect starting point for those with no experience. Even those with a lot of experience, can pad their resume with these. If you need to leave one of these out, make it the i-Net+/Security+ box. After completing these certifications is where most people get hung up? CCNA or MCSE? Should I get the CIW? How about Linux? It is much the same as picking a major in college which can be quite difficult if you don't have set career plans. This is part of the reason most colleges and universities require general studies; They help you get exposure to a wide range of topics in order to narrow down your interests. So how do you do this after completing your entry-level certification? Get a job! There are a lot of people that will swear that it is impossible to get a job unless you have an MCSE or other high level certification. This is patently false. You do not need high level certification in order to obtain an entry-level job. What you do need in addition to the certs that you picked up are a professional resume, good cover letter, interview skills, a desire to learn, and a personality that makes companies want to hire you. Your first job will likely be at a helpdesk, working in a techsupport call center, contract work through a temp agency, etc. After 6 months at your new job, it is a good time to begin thinking about moving forward with your certifications. Hopefully, you have been exposed to a few things and have a better idea as to what you do or don't want to do. This is important because you are at a fork in the road and it is time to make some choices. The following graphic shows a few of the many job roles available in the IT industry and some the corresponding certifications sorted by experience level. It should be noted that these are not the only certifications available for each of these job roles and this certainly does not cover all of the job roles in IT. If you wanted to become a database administrator, for example, there would be a completely different certification path than anything displayed in the graphic. You should also note that the certifications displayed above are some of the more popular ones, but by no means the most valuable in all situations. For example, if you are a Juniper or Oracle specialist, their certifications will likely be more valuable in that market than some of the larger ones discussed in this article. It is also important to note that the world isn't black and white and there are special circumstances. Many people work for smaller companies where they are the entire IT department. These people are often skilled in multiple job roles and it probably makes sense for their certifications to reflect that. Others may start down one path, realize they have made a mistake, and switch directions. The point of this article was to show exactly how certifications are tied to job roles and experience levels. Now, if I ask you, "Should I get a MCSE or CCNA? ", you will realize that this question is unanswerable. Even if you know how much experience I have, how can you tell me what I WANT to do for a living? It is like asking someone if you should become a doctor or a lawyer.